The last blog was all about preparing the stock for this sliding door which is followed by the joinery. All joints are mortise and tenon and vary from 2″ to 1 1/2″ in length. Following the 1/3 customary rule they are 3/8″ wide which is as close to that I can get since the stock is a full inch in thickness. I anticipated that since the members of this frame are all around 5″ wide there was the potential for fitting issues so they have full haunches to curb that as much as possible. With the longest piece measuring 85″ the camera tripod was used to support the end, probably not the sturdiest but it did the job! Before the mortise and tenon process began a 3/8″ deep by 1/4″ wide groove was cut in all inside edges on the tablesaw. The bottom of the door will have plywood panels while the top will have tempered glass. My plan is to remove one side of the groove at glass area with a 3/8″ rabbeting bit after the door is fully assembled. After that a glass stop will be milled that will secure the glass in the opening. Since the dado head was set up in the saw and some of the tenons needed were on the end of an almost 7′ board it seemed best to rough them out using the dado rather than a tenoning jig which I prefer. Someone said on their blog that they never tire of the steps needed to do joinery, whether it’s dovetails, mortise & tenons, laps, etc. Even though you may do them time and time again it’s always a challenge. Here’s a montage of how I go about it, the twin tenons are on the bottom piece which is 6″ wide. The first pieces to be assembled are the top and bottom horizontal ones with the center vertical one. With the tendency for a 10′ pipe clamp and the wood to begin to flex under pressure my aim to center act that was by clamping the pipe between two old Black and Decker Benchmates; remember those? This helped keep the pipe stabilized and then as the board started flexing it was clamped to the Benchmate. Also made come longer cauls to help spread the clamping pressure. Looks as if it worked, we’ll know tomorrow when it’s all unclamped. Before going any further the 1/4″ plywood has to come in. It will need to be prefinished prior to glue up and then it looks as if the glue up will take place in two stages. At 56″ wide and 85″ tall there is no choice other than gluing up on the floor or maybe on the Benchmates as shown in that picture above. Have my idea of how to go about it and will let you know how that works! 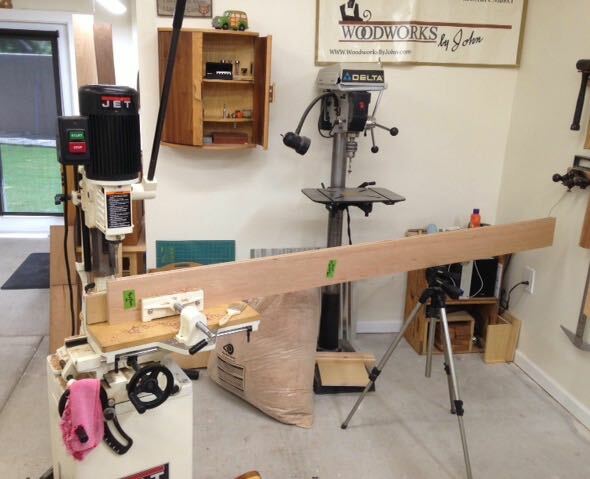 This entry was posted in Mortise and Tenon Joint and tagged Black & Decker Benchmate, Cherry, clamping, haunched tenon, mortise and tenon, Sliding Door. Bookmark the permalink.